Coinciding with today’s launch of Intel’s HEDT “Skylake-X/Basin Falls Refresh” family of CPUs, G.Skill today announced its new 64 GB DDR4-4266 and 128 GB DDR4-4000 kits designed for high-end desktops. 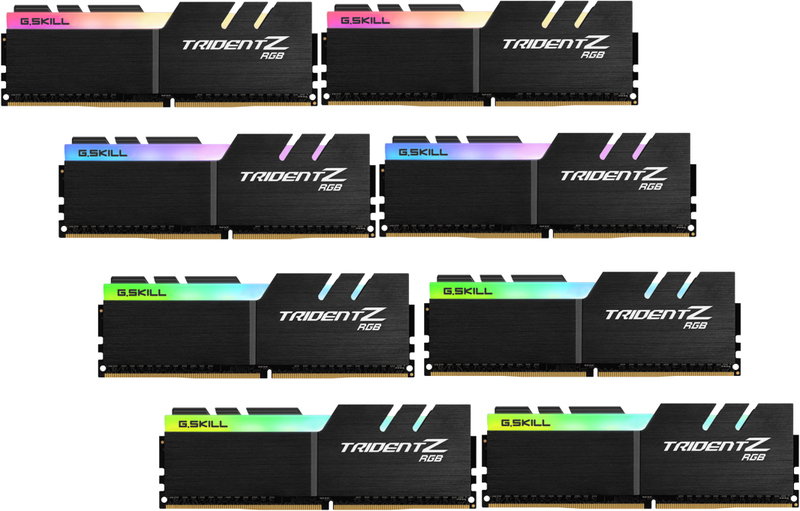 G.Skill’s new Trident Z quad-channel memory includes a 64 GB (8×8 GB) kit rated to run at DDR4-4266 CL19 19-19-39 with 1.45 Volts, and a 128 GB (8×16 GB) set designed to operate at DDR4-4000 CL19 19-19-39 with 1.35 Volts. The DIMMs are based on Samsung’s time-proven B-die memory chips that are used for overclocking-grade modules, feature XMP 2.0 SPD profiles for easier set up, and are outfitted with aluminum heat spreaders. DDR4-4000 CL19 19-19-39 1.35 V 8×16 GB 128 GB Trident Z RGB ? DDR4-4266 CL19 19-19-39 1.45 V 8×8 GB 64 GB Trident Z ? Since we are dealing with very high-performance SKUs, G.Skill requires them to run on high-end motherboards capable of delivering a “clean” power supply and keep the amount of interference at minimal levels. So far, G.Skill has validated the kits with the ASUS Prime X299-Deluxe II motherboard, though the list of "officially" compatible platforms may expand over time. One thing to note about the 64 GB DDR4-4266 1.45 V kit is that it runs at a voltage that is 20% over DDR4 standard's default voltage of 1.2 V, which means that power consumption of the kit will be noticably higher than standard modules (keep in mind that power consumption increases with the square of the voltage). Therefore, the kit will require good cooling as well. In the meantime, the 128 GB kit will also use a fair bit of power simply because of its capacity. G.Skill plans to start sales of its new Trident Z 64 GB DDR4-4266 and 128 GB DDR4-4000 quad-channel memory kits sometime in the first quarter of 2019. Along those lines, since they're still a quarter out from launch, the company has not announced the pricing of the new products, as that will depend on the spot price of DRAM at the time. Meanwhile, given the performance and capacities of the modules, expect the kits to carry a premium price tag.